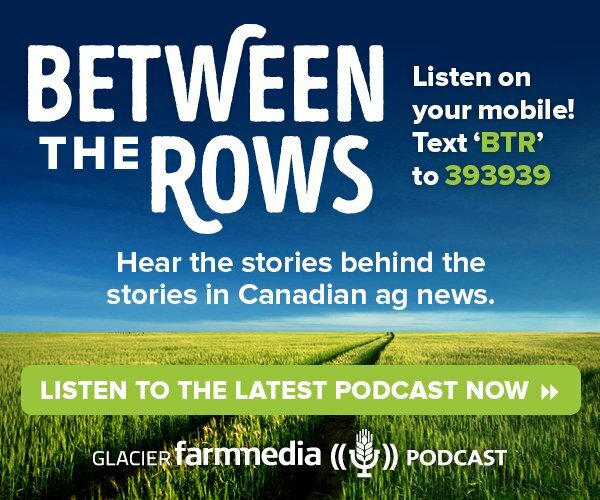 Between The Rows is a weekly podcast featuring the Glacier FarmMedia editorial team bringing you the ‘story behind the stories’ in ag news and markets. Drawing from our more than 20 print and online brands, our reporting staff will discuss the top stories and latest developments in agriculture today. Between the Rows goes beyond the printed story and delves deeper to bring more detail on stories that affect today’s producers. Each episode features 2 or more of the most important ag stories of the week, anchored by a comprehensive, in-depth look at the markets by one of our top analysts. Farmtario editor John Greig reports on the challenges Ontario wheat buyers have in sourcing a local hard red wheat supply, Alexis Stockford with the Manitoba Co-operator reports on how the Manitoba government aims to support both plant and animal protein sectors, Western Producer reporter Jeremy Simes discovers what a group of university students are doing to educate consumers on how to properly cook beef, and Bruce Burnett of Glacier FarmMedia MarketsFarm discusses spring seeding and soil moisture conditions on the Prairies. Hosted by Laura Rance. Ed White of the Western Producer speaks with Brunel Sabourin at the Red River Soil Health Summit about tillage and soil health practices in Manitoba, Canadian Cattlemen editor Lisa Guenther talks about sainfoin research to help reduce alfalfa bloat in cattle, Canadian Cattlemen field editor Piper Whelan reports on how producers are tweaking their forage rotations to improve yield and quality, Western Producer editor Brian Macleod offers a look inside the Producer newsroom and its approach to agricultural reporting, and Phil Franz-Warkentin of MarketsFarm reports on news in commodity markets. Hosted by Ed White. Sean Pratt with the Western Producer offers an update on China’s halt in Canadian canola shipments and what the federal government is doing to get things moving again, Jennifer Blair with the Alberta Farmer reports on a smartphone app that helps farmers find their best grain price, Alexis Stockford with the Manitoba Co-operator reports on how well farmers are managing with the flood of farm data at their fingertips, and Phil Franz-Warkentin of MarketsFarm reports on the latest market news and how farmers’ seeding plans could reshape commodity markets. Hosted by Gord Gilmour. Allan Dawson of the Manitoba Co-operator reports on conversations at the Canadian Crops Convention about China’s decision to block Richardson International’s canola shipments (includes audio recordings of Chrystia Freeland, Canada’s minister of foreign affairs, and David Dzisiak past chair of the Canola Council of Canada), a quick take with Marie-Claude Bibeau, Canada’s first female agriculture minister, Robin Booker, reporter with the Western Producer, reveals how he used ATIP to find out about PMRA’s decision to limit engagement on MRLs, and Phil Franz-Warkentin takes a look at the week in commodity markets. Hosted by Ed White. Dr. Egan Brockhoff, veterinarian with Prairie Swine Health Services, sheds light on the African swine fever virus and its threat to the Canadian hog industry, Jennifer Blair with the Alberta Farmer Express reports on Alberta brewers using blockchain technology to tell – and sell – the story of beer, and Bruce Burnett with MarketsFarm offers an update on the price slide in canola, the market situation in relation to China, and why wheat markets have also seen a recent slump. Hosted by Robert Arnason. The birds and the beef, your right to repair, food waste by weight, and how low will canola go? Lorraine Stevenson, reporter with the Manitoba Co-operator, reports on why conservationists should consider supporting beef producers to help protect species-at-risk, Scott Garvey, machinery editor for Grainews, discusses how technology and copyright is influencing the right to repair debate for farm equipment, Farmtario editor John Greig reports on a new study that looks at the amount of food waste occurring before it reaches consumers, and Phil Franz-Warkentin of MarketsFarm offers his take on the struggling canola market and what –if any – optimism is to be found in soybean markets. Hosted by Gord Gilmour. Slowing the spread of clubroot, amalgamations and seed royalty proposals, and bullish wheat markets ahead? Scott Keller, a mixed grain farmer in New Norway, Alta., talks about his concern over the advancing spread of clubroot in canola crops and what producers can do to prevent the yield-robbing disease from extending its range, Allan Dawson with the Manitoba Co-operator reports on crop organization mergers and why Manitoba farmers are feeling “checkoff fatigued,” while offering an update on the seed royalty proposal debate, and Mike Krueger, an analyst with World Perspectives, reveals what factors are in play for him to predict that wheat markets look bullish in 2019. Hosted by Ed White. Farm family coach and Grainews columnist Elaine Froese discusses the unique relationship challenges facing farm couples and the importance of maintaining your farm team’s “emotional bank account,” Martin Métivier, television producer for Attraction Images, talks about its reality show “L’Amour est dans le Pré” (Love is in the Field) that’s playing cupid to help bachelor farmers in Quebec find love, and Phil Franz-Warkentin of Glacier MarketsFarm offers his report on how the markets reacted after the recent end of the U.S. government shutdown. Hosted by Dave Bedard.